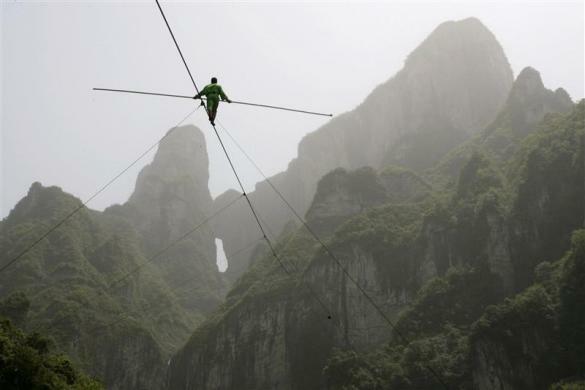 Samat Hasan, a 24-year-old stuntman from Xinjiang Uighur Autonomous Region, walked on a tightrope in Zhangjiajie, Hunan province, on April 25, 2009. Walking on a 700-m long (2,300 ft) rope with a 3.1-cm (1.2 in) diameter and set at a 39-degree gradient, Hasan successfully performed the aerial tightrope walking after failing in a previous attempt in October 2008. Comments for TALLEST AERIAL TIGHT ROPE WALKER are now closed.